I love Chwee Kueh. Lately whenever I go back to Singapore, me and my better half will always drive down to our favorite store to chow down a big plate. Some might think that it's easy to make and not hard to get the perfect taste & texture. 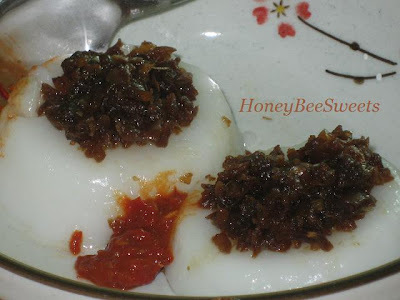 Well, understandable since most of the recipes I have come across on Chwee Kueh are relatively easy. 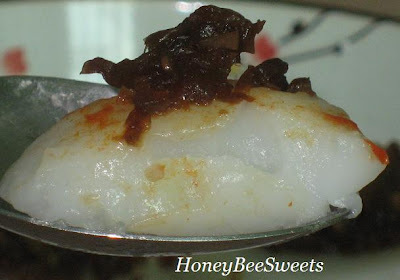 Rice flour, water, salt, oil etc mixed together, steam and plus the preserved radish topping. 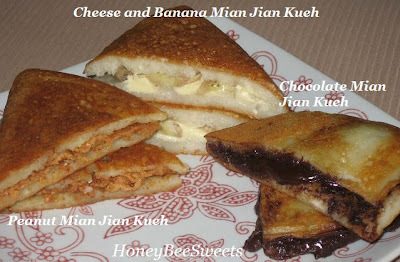 But the texture of the kueh can be quite different even with the amount of water you used, not to mention the kind of flour added to it. Not too long ago, a good friend has kindly invited me to her kitchen to "experiment" on a recipe from a cookbook. It turned out okay, but we both knew after tasting it, that it can still be improved. So I have vowed to try it out again myself. 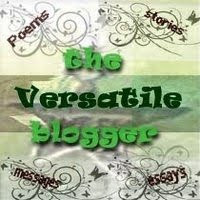 I have searched for the longest time and found a good recipe on another blog; My Culinary Journal. (<=Thanks!) Some how the ingredients involved are quite different from the day I tried with my friend, so I decided to give it a try. I was glad I did because it turn out pretty good, texture wise was softer, but "bouncier", haha! Put rice flour, wheat starch and cornflour into a mixing bowl. Add 400 ml of cold water to the flour mixture, use a wooden spoon to stir. Pour the hot water over the flour mixture, then stir it, add salt & oil to batter and mix together well. Keep stirring until batter is like glue texture. If the batter is not transparent, or looks watery glue texture, bring it over the stove to cook it again, until a portion of it stick to the wooden ladle. Remove from fire. Oil the mould with a little cooking oil, pour the batter into the mould, filled about ¾ full. Then add 1 tsp of cold water as topping before bringing batter to steam. Steaming time about 15 - 20 minutes. After 20 minutes, open the cover, check to see if there is a depression of water content in the center, leave the fire on, let it cook for 5 mins more with cover off, to steam dry the pool of water in kueh center. Once dried, off fire. Wait for it to cool for at least 10 to 15 minutes before unmoulding it. Soaked the preserved radish in warm water for at least 15 minutes. Then rinsed off the water. Chop up if it is not already in minced bits. In a cooking pan, add cooking oil and stir fry the garlic and shallots still fragrant. Add both preserved radish and stir fry for a couple of minutes. Add the seasoning and stir fry for another 5 minutes at low heat. Add toasted sesame if using. Remove from pan and set aside till use. Have asked 3 good friends to taste test it and all have given thumbs up. So I guess this recipe is indeed a keeper. 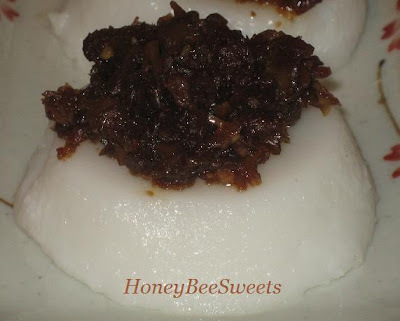 Another thing I realize about this homemade Chwee Kueh is, it's not as oily as the those sold in stores. Well, perhaps it's much easier for the store owners to handle the kueh with the extra oil added...but it ain't good for the body I tell you. Again, another winning vote for the homemade yummies! Me and my husband loves it with chili...one that my good friend bought from Seramban for us...so delicious eating it together! I even made Steam yam cake that day too...so double the treat! (forget about double the fat!) 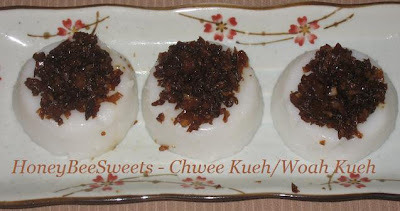 So if you do try this Chwee Kueh recipe, do let me know how yours turn out. Cheers all! Frankly speaking, I am even more surprise receiving this award then the previous one, haha! 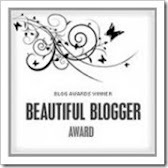 Wow, Best Blog Award, ....geeze I am truly amazed! Anyway, enough with the babbling....I feel like those celebs that receive Oscar and standing in front of thousands of audience, brain freeze, speechless or just mumbling nonsense, haha! So first I like to thank traciMoo (A.K.A Bitter Sweet Flavors) for passing this lovely award to me, very sweet of her to think of me, thank you for the encouragment and support! 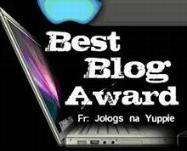 ~To accept the award, post it on your blog together with the name of the person who has granted the award and his/her blog link. 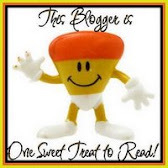 ~Pass the award to 5 other blogs that you've discovered and think are great! I'm kind of relieved that I need not talk about myself upon receiving this award, haha! 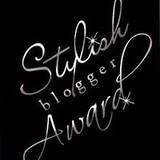 But still having to search for 5 bloggers to pass this award to is no easy peasy stuff! But still I managed...so drum roll please! Here they are in no particular order or preference! Joy of Baking - By Stephanie whose site has such a wide collection of great recipes to share and always comprehensive enough for the novice bakers. Daily Delicious : By Pook; whom has the most amazing blog with 3 languages (i.e. 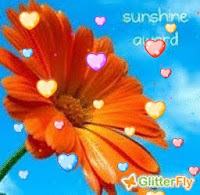 Thai, Jap & Eng) with lovely and mouth watering recipes posts. Zen Cupcakes - A blog that exhibits the most amazing collection of cupcakes all over the world. My Hello Kitty fondant cupcakes were posted by her too! Piggy's Cooking Journal - A lovely blog by Grace which displays great recipes and pictures. Smitten Kitchen -By Deb from New York City. Love reading her posts (great writer) and her recipes. 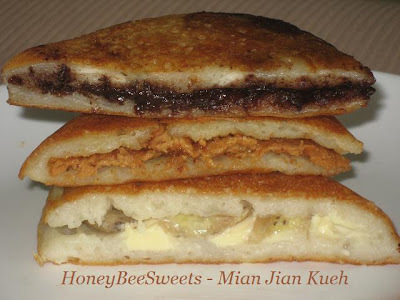 Mian Jian Kueh or Asian Pancake as some of you might call it, is one of the favorite snacks that I grew up eating. I remember I would be the first in the family to munch it up every time my mum buys it fresh from the market in the morning. So it comes to no surprise that I will eventually make this delicious treat at home. Well, maybe the delay is due to having no confidence in finding and trying out a good recipe. Since I have tasted very good ones in Singapore....which are the store bought ones of course, so that kind of discouraged me even further, haha! Anyway, this lazy Sunday morning with nothing in particular to do, I decide the time has come for me to finally to do it. Slice the cheese wedges into thinner slices. Also slice the banana, length wise . Melt the chocolate in double boiler with the light corn syrup till smooth. You can add 1 tbsp of caster sugar if you prefer sweeter version. Mixed all ingredients for the pancake batter together in a large mixing bowl. Let batter proof for at least 2hrs before use. Heat up a non-stick frying pan of at least 15 inches wide. Cooking oil is optional is your pan is non-stick. Add 1/3 of the batter into the pan at low to medium heat, cover the lid and let cook for 2 minutes. Remove lid and reduce the heat to small. Then add one of the filling on one side of the pancake. 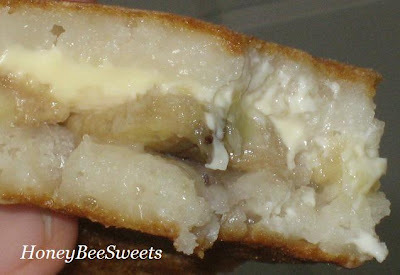 For cheese filling; Gently place the sliced wedges on one side of the pancake surface, follow by the sliced banana. 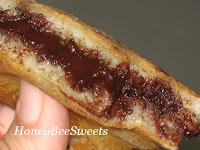 For Chocolate filling; Gently spread the chocolate on one side of the pancake. For Peanut filling; Gently spread the creamy peanut butter on one side of the pancake, then sprinke the roasted gound peanuts over it. 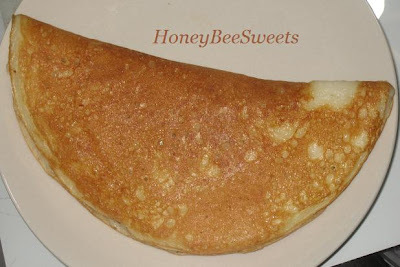 Then you gently using the spatula, flip the other side of the pancake without the filling over to close up the pancake, making it a semi-circle. Remove from it and place on a clean chopping board and cut it into 4 wedges. Personally, I love the peanut version...what can I say, I am nuts over peanuts, haha! 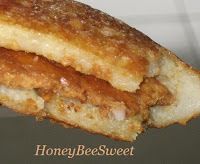 Love the extra crunch from the roasted peanuts added on top....and it was not too sweet like those store bought ones, since mine was a organic peanut butter with no sugar added. Yum-O! The chocolate filling was actually my girls' favorite. I was kind of surprise because it is slightly on the bitter side since I did not add any extra sugar to the 70% cocoa chocolate and corn syrup. But I am glad that they like dark chocolate since it is healthier then the milk version. Perhaps the next time I make, I will try a different recipe. Also will try filling it with traditional red bean filling. ;) Have a great week all! Lately the air quality in KL is getting from bad to worst. Every morning there is always a thick haze overcast in the atmosphere with a slight hint of smoky smell in the air. All this is due to the forest fires in Sumatra, Indonesia. No no, it's not because of the heat that causes the fire...it is actually set by developers in Sumatra to clear the land! *sigh* The damages that human does to earth is really beyond toleration sometimes. I just wish that our future generations will still be able to enjoy the seer beauty of nature and not having to suffer from the mistakes that their fore fathers have done to the environment. Okay, enough with being poetic...let's get back to today's post. 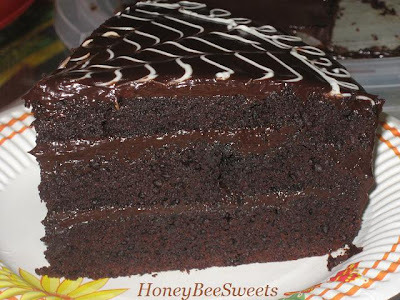 Have been having that familiar craving lately....yeah that one, chocolate....a good piece of dark chocolate cake of course. 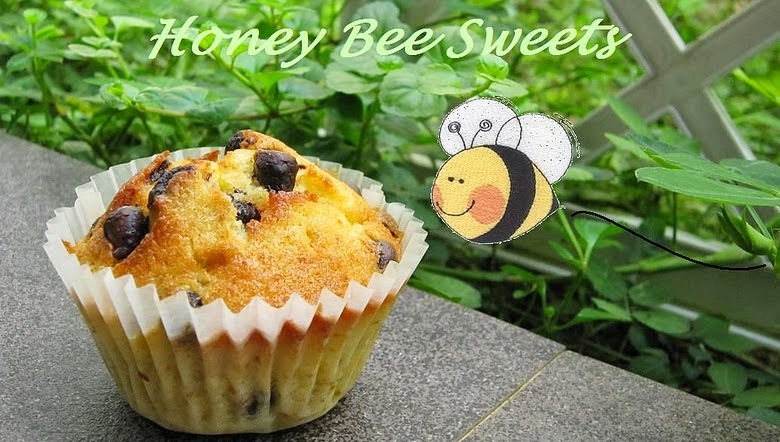 So I browse through my cook books and found an easy enough recipe in Y3K's "Delicious Cakes" by Amy Heng. 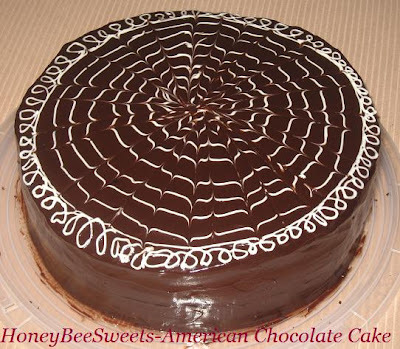 The American Chocolate Cake! Fortunately I have all the ingredients in my pantry so I got to work immediately. Heat the cream in double boiler method til bubbling, pour over chopped chocolate. Let mixture stand for 3 minutes before stirring it. Stir mixture till smooth and let cool and refrigerate till needed. Line and grease a 10" round baking tin. Preheat the oven to 170°C. In a mixing bowl, beat the butter, vanilla extract and sugar together till light and fluffy. Add in one egg at a time and mix well after each addition. Sift the dry ingredients and set aside. Mix the hot water with the cocoa powder and set aside. Alternating the flour and cocoa mixture into the egg mixture and incorporate till everything is used, ending with the flour mixture. Pour the batter into the prepared cake tin and bake for 50mins to 1hr, or till cake tester comes out clean. Let cool on rack. 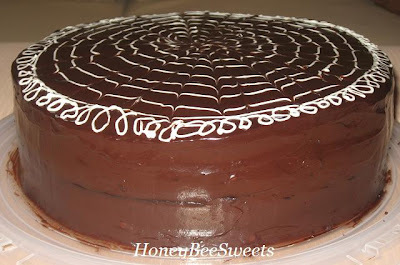 Then using a serrated knife, cut the cake into 3 layers horizontally. Spread 1/4 of the chocolate filling on the 1st layer of the cake. Top with the 2nd layer and spread another 1/4 of the filling. 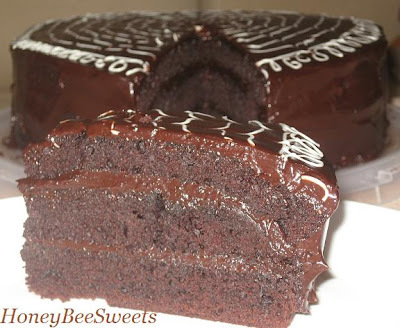 Then place the last layer over and frost the rest of the chocolate ganache over the whole cake. Using a piping bag, pipe circles on the surface of the cake. Using a toothpick to create a feathery effect by dragging the toothpick across the piped chocolate. The cake was tender & decadent, definitely a chocolate "curbing" fix, haha! I had a big slice (the picture shown above) and was completely satisfied....mmm, got milk?! Thinking of what to make for breakfast for my family tomorrow. Again falling back to bread, since it can be prepared ahead of time and stored up to 3 days....lazy me. 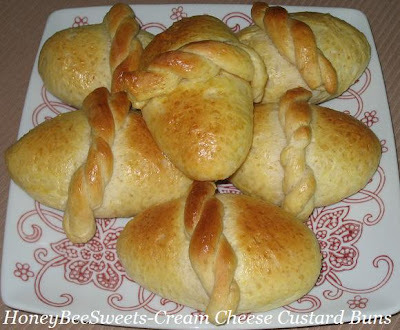 :) The cream cheese in my fridge needs to be used up too, so I decided to come up with something different; Cream Cheese Custard Oat Buns. I modified my own Instant Oat Loaf recipe so I can use it here and then also modified a custard recipe to create a cream cheese version. Saw this bread moulding method on a Japanese food site and so decided to try it out too. In a mixing bowl, beat the cream cheese and sugar together till creamy. Add egg and mix well. Then stir in cake flour and mix till well combined. Add the milk and stir well, then using double boiler method, stir and cook the mixture at medium heat till it thickens and bubble. Remove from heat and add lemon juice and butter. In a small pot, cook the instant oats with the milk in Set A with low fire till the mixture is thick and lumpy. Remove from fire and set aside to cool. Refrigerate the mixture for an hour before use. Mix all ingredients in Set B except for butter together with the mixture in Set A in a large mixing bowl to form a soft dough. Knead the dough till it is not sticky, about 20 minutes. Place dough in a greased bowl and cover with plastic wrap and allow to proof for at least 90 minutes to 2hrs till double in size. After proofing, divide the dough into 12 portions. Roll each dough piece into a ball and let rest for 10 minutes before moulding. For each dough ball, cut out about 1/6 of it and set aside for the plaited dough on top. To the remaining dough, roll it our flat using a rolling pin into a flat disc. 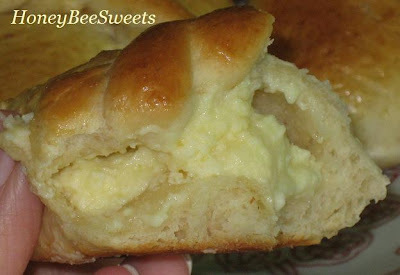 Scoop about 1.5 tbsp of the cream cheese custard filling in the center and seal it up tightly. Place the sealed dough on a baking tray lined with parchment paper. 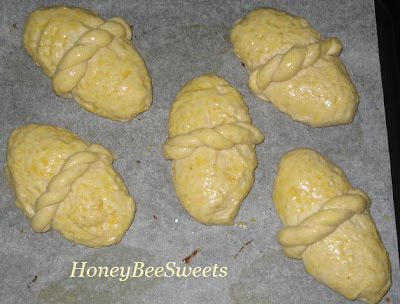 With the 1/6 of the dough, divide into 2 and roll into small logs and pressing one end together, twist the 2 logs together to get the plaited pattern. Place the twisted logs gently on top of the filled dough, in the middle. Then repeat with the rest of the 11 dough balls. Let the dough proof for another 20 minutes before baking. Preheat the oven to 180°C. Brush the top of buns with egg wash.
Bake the buns in the oven for 2o to 22 minutes till golden brown. Serve! Overall still a satisfactory recipe, will definitely try out different filling or dough recipe next time. Happy baking! Loves to drive, especially along the coast. Favorite comfort food are bread & nonya laksa. Had the most delicious meal in a French restaurant call French Laundry in Sonoma County, California. Enjoys French pastry desert the most. loving baking; A pretty and freshly graduated student whom loves to bake. Cafe Corner; One of my favorite sites to go to, with detail descriptions of steps and recipe. ieatishootipost; A great blog especially for people like me (being away for so long) to find out where to eat the best food in Singapore. foodbeam; A French pastry chef with great works in baking and photography. My Home Kitchen; Being a "secret" follower on this nice blog. ReeseKitchen; A great friend and a good cook, fortunate to come to know her. 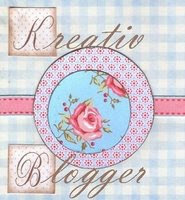 Joy The Baker; One of my inspirations, never a dull moment when I visit her blog! It has been 9 months since I started blogging and there is no looking back since then. But it has been fun! 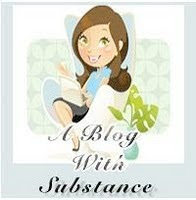 I wish there will be more readers visiting my blog and leaving supporting comments for me. Thanks again Small Small baker for this special award, really appreciate it. I am glad I got the chance to do it. ;) Cheers all! In a mixing bowl, beat butter and sugar together till pale and fluffy. Add eggs into the mixture one at a time and beat the mixture till incorporated. Add buttermilk and mix well. Then add the mashed bananas in and stir in well. Sift all the dry ingredients in and mix till just combined. 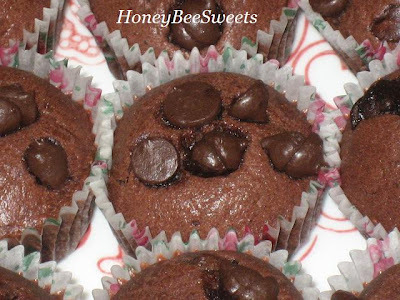 Line muffin tins with paper cups and scoop the batter in to 2/3 full. Top a few more chocolate chips on top if desired. 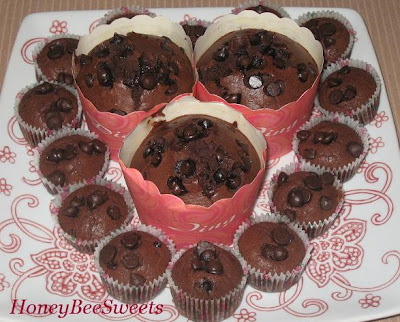 Bake in the oven for 15 minutes for small cupcakes and 20 minutes for large ones. The cake tester or toothpick should come out clean when done. I figured those super ripe bananas I used are pretty sweet, so I have used less sugar in the recipe. So if you decided to try out this recipe and wants a slightly sweeter version, you can add an extra 15 to 20g of sugar into the recipe. 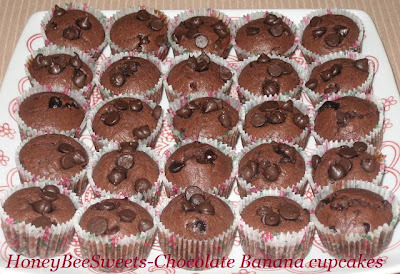 Overall the taste is great, light and not too sweet and I am sure you know when you combine bananas and chocolate together, it's yummy. ;) Try it out and you'll see what I mean. :) Happy bakes! Punch out the air in the dough and divide it into 4 equal portions. Roll out each portion into a long flat oval shape and roll up one end to make it into a swiss roll form. 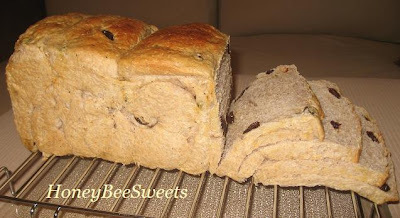 Placed the dough into a greased loaf tin and repeat with the rest of the 2 portions. Cover and let proof for another 2hrs or till the loaf fills 90% of the tin. Preheat the oven to 180°C. Brush the top of loaf with egg wash.
Bake loaf in the oven for 40 to 45 minutes. If top browns too quickly, cover with aluminum foil till baking time is up. When done, take out from oven and unmold immediately and let cool on rack before slicing. If you are wondering how come my loaf has a rather "flat" top...well because I usually proof my dough using the tin cover. And surprisingly, this loaf rises pretty fast and it was already pressing on the cover when I checked on it after an hr! ;P So anyway, I let it proof without the cover for another 15 mins before baking....so it puffs up a little. 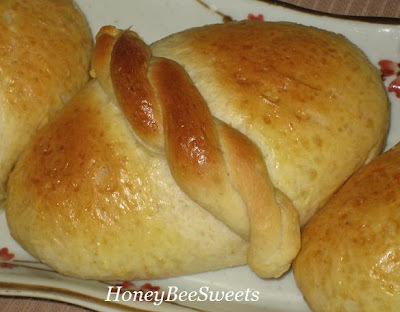 This is again a super soft and yummy bread. When it is fresh out of the oven, me and my girls each devour a slice without any spread, even after we just had our dinner, haha! The faint smell and taste of the blueberry is really nice. 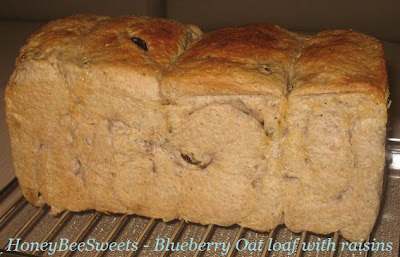 And with the raisins, this loaf is good on it's own. Okay, maybe the blueberry did not give a distinct blue color, but it's alright so long as it taste good. The taste of oats was evident since I added quite a bit of it to the recipe, but I love it and it's healthy too. 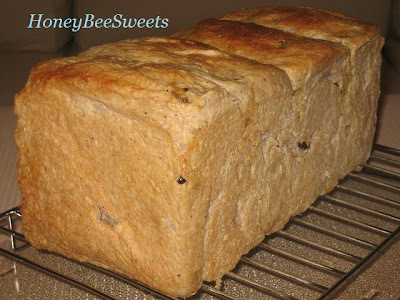 ;) No worries if you fear that there will be chunky oats in the bread....in fact all the oats will be "melted" in and all you taste is soft, delicious bread. And this is the perfect way to get your kids to eat oats if they do not really like it. 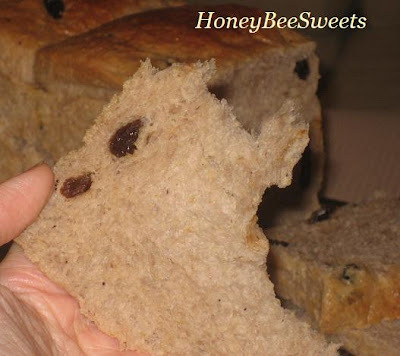 Tired of the same old white loaf that you buy from the store shelf? 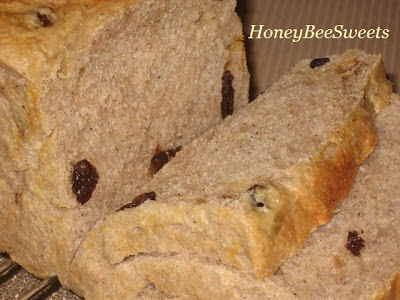 Why not get your hands working and start making this healthy and delicious loaf now? You will not regret it, I am sure of that. :) Cheers!